Join the discussion on our forums! 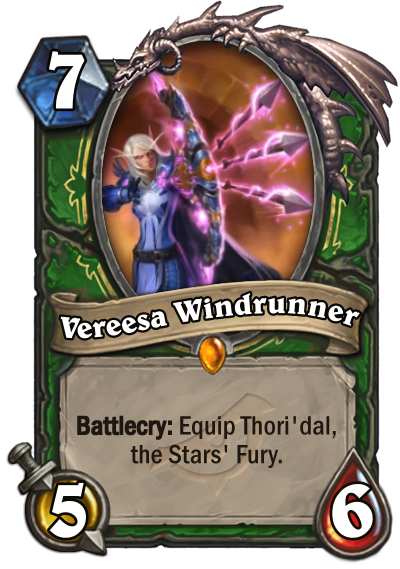 Come discuss Vereesa Windrunner over in our dedicated Vereesa Windrunner discussion topic. Good things come in threes: Windrunner sisters and arrows of Thori'dal. Got her golden from a pack. I thought this card was trash, i dusted it. Then someone went deep into legend with it and jepetto and now ppl think its broken. Its not broken. I've come across it 3 times, lost but once, and it was not due to that card. The jepetto malygos hunter combo was on the first day of the new meta and has yet to be seen as successful since. Spell hunter is like tier 2-3 right now, Oblivitron and deathrattle hunter is broken tho. This is it, Blizzard? 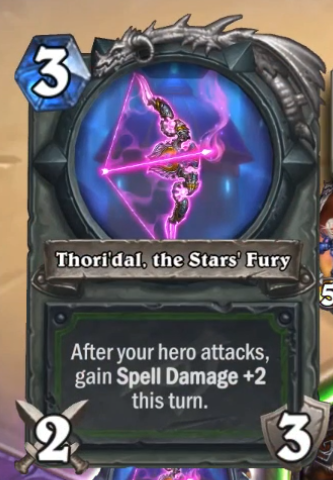 This and a handful of even weaker cards are what's going to replace Rhok'delar in Spell Hunter, three turns of Spell Damage +2 on a 2/3 weapon? I didn't care for the deck archetype before rotation, but this actually makes Mech Hunter look appealing in comparison. Can i get it from Stolen Steel? In between this, as well as Tuskarr Fishermen and Ancient Mages on more durable stealth minions, and, of course, not just Arcane Shot, but also the new Rapid Fire, I think we may have Malygos OTK hunter without Malygos, on our hands. I meant a non-malygos one, though. A reliable one too, which Jepetto isn't really when with just 1 minion.